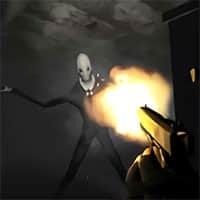 Slenderman Must Die is a first-person shooting video game based on the horror survival game Slenderman the nine pages. In this game, you are in the middle of infiltrating an isolated and scary town when you suddenly got lost and lost contact from your squad. Now you are alone in the abandoned industrial area with a scary creature haunting you. Turn the tables around and let the hunter be the hunted in this awesome game. Find the 9 notes scattered in the area and shoot down the faceless man in a suit. Infiltrate an isolated haunted town and hunt down the scary urban legend Slenderman! Find the 9 notes and defeat the Slenderman in Slenderman Must Die: Industrial Waste! Good luck soldier! Slenderman Must Die is a free online action game on Round Games.